Generation Zero, the open world survival game that’s set in 1980s Sweden and sees you taking on violent giant robots, has finally released fully. Here’s everything you need to know about how to save in Generation Zero. As you roam the varied open world, you’re going to come across loads of dangerous robot enemies. Therefore, you’re going to want to know how to keep your progress so that you don’t have to worry every time you travel anywhere. The best way to ensure that your progress is saving in Generation Zero is to head to one of the many safehouses that are spread across the map. Not only will the game save if you just walk up to them as you’re exploring, but it will also do so if you fast travel to any that you’ve previously unlocked. 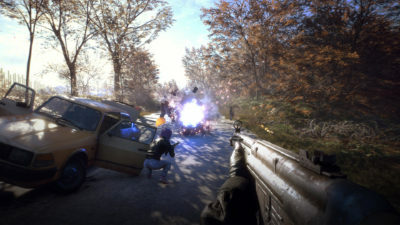 The game saves automatically at that time and it is shown by a little Generation Zero symbol appearing in the top right of the screen. Once the symbol disappears, you can be safe in the knowledge that your progress has been saved. If you’re playing the game in co-op though, the save system seems to be a little more complex. While, in an interview with PCGamesN last year, the developers said, “The things you do together will be saved in both of your worlds. The things [your co-op partners] pick up in your game will carry back to their world as well,” it doesn’t seem to be so seamless in the full release. It seems as progress is only saved for the host in Generation Zero co-op, particularly if they’re a higher level than their partner, so the second person has to replay parts of the game if they plan to go it alone at another time. Once that’s all cleared up, though, we’ll be sure to let you know. That’s everything you need to know about how to save in Generation Zero. For more tips and tricks on the game, be sure to search for Twinfinite.